Lorenzo Magnani and Riccardo Dossena, eds. This volume is a collection of papers that explore various areas of common interest between philosophy, computing, and cognition. The book illustrates the rich intrigue of this fascinating recent intellectual story. It begins by providing a new analysis of the ideas related to computer ethics, such as the role in information technology of the so-called moral mediators, the relationship between intelligent machines and warfare, and the new opportunities offered by telepresnece, for example in teaching and learning. The book also ties together the concerns of epistemology and logic, showing, for example, the connections between computers, bio-robotics, and scientific research and between computational programs and scientific discovery. Important results coming from recent computational models of deduction, the dynamic nature of meaning, and the role of reasoning and learning in spatial, visual and exemplar-based compuational frameworks are also addressed. Some stimulating papers carefully study how the interplay between computing and philosophy has also shed new light on the role of rational acceptance in the logic of belief and on the status of old philosophical topics like embodiment and consciousness, the role of information and the problem of realism in the new digital world. Finally, a considerable part of the book addresses the role of intenal and external representations in scientific reasoning and creative inferences as well as the place of manipulation of objects and artifacts in human cognition. Taking these topics together this book describes an aspect of an emerging agenda which is likely to carry the interaction between philosophy, cognition and computing forward into the twenty-first century. 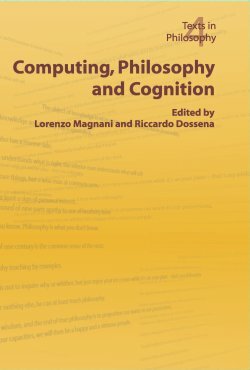 The volume is based on the papers that were presented at the International European Conference Computing and Philosophy, E-CAP2004, Italy, held at the University of Paiva, Paiv, Italy in June 2004, chaired by Lorenzo Magnani.